The first time I ever mentioned this product, I referred to it as an “ugly mess of a product.” I know those seem like harsh and shocking words (in fact, I take them back), especially coming from a fan of the Gold Label series, but in my opinion, this product just never quite measured up to its predecessors. Don’t get me wrong, it’s still a nice set. In fact, if I didn’t think so, I wouldn’t have included it in Old School Group Break 2. However, it still is what I consider the “weak link” in the series, which happened to end with this very set. See if you agree. 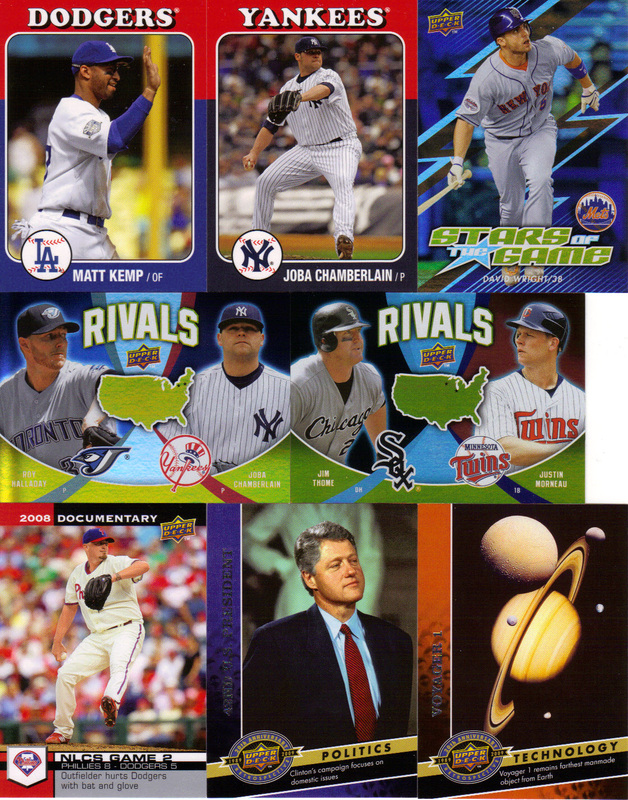 Base set: The base set is comprised of 200 cards and if you’re into hugely nameplated surnames, this set’s for you! That was actually a small pet peeve I’ve always had with this product (but the biggest one will be revealed later). Anyway, you might notice that these cards don’t shine the way the older GL cards do. Compare. Here you’ll notice a holofoil effect as opposed to a heavily glossed refractor effect, a different look from the “super premium” cards from previous sets. My box yielded 64 of 200 basic cards (32%) and 1 duplicate. 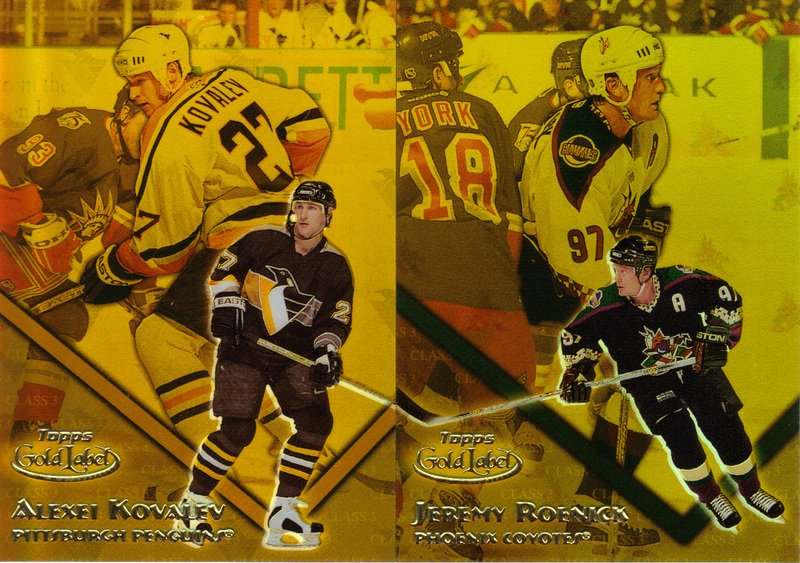 Gold (1:7 packs, numbered to 500): There are 3 parallels that mirror the base set: Gold, Platinum, and Titanium. 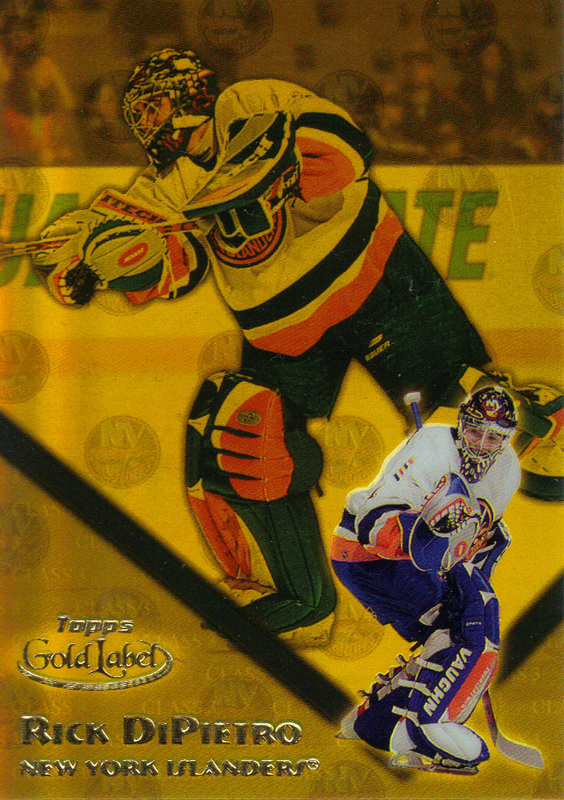 The Gold cards, the most easily attainable, are seeded 1 in every 7 packs (1 in 11 retail) and are numbered to 500. 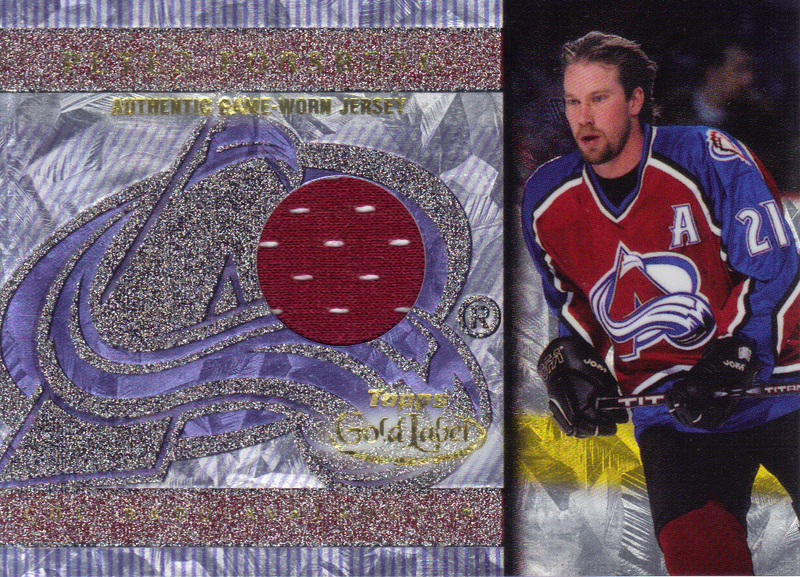 I pulled 3: Garret Anderson (312/500, there he is again! ), Derek Bell (002/500), and Tim Hudson (346/500). Platinum (1:13 packs, numbered to 250): Slightly harder to find than the Golds, the Platinum parallels are seeded 1 in every 13 packs (1 in 28 retail) and are numbered to 250. 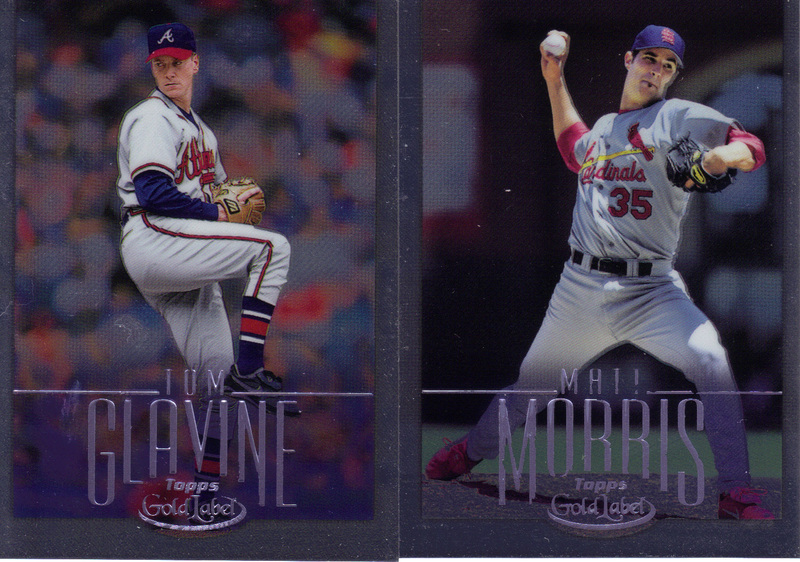 I beat the odds and pulled 2 in my box: Tom Glavine (181/250) and Matt Morris (174/250). 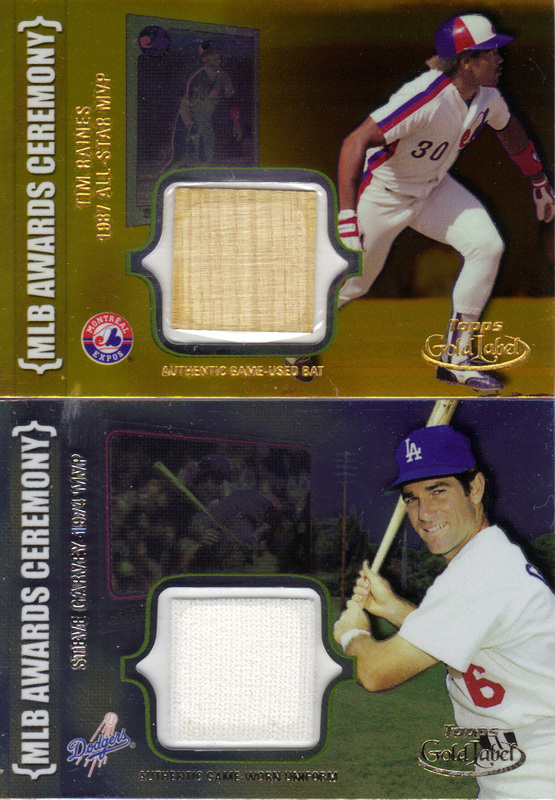 My box yielded a Tim Raines Gold Bat and a Steve Garvey Titanium Jersey. I like how the Topps card corresponding with the award-winning year hangs in the background. Overall, the design is decent enough (though not as good as the previous year’s), but it just seems so weird to have cards this dark in the Gold Label brand. The same can be said for the parallels. Oh yeah, and these have to be the thinnest game-used cards ever. They comfortably fit in your standard toploader. No complaints here. 1 duplicate sure beats out the 15 duplicates from that last box I broke, both of which were made of 4-card packs. There were a couple minor blemishes, but they were few and far between. I have pulled creased cards from this product before though. Overall, I was satisfied with my pulls. The parallel cards (minus Glavine) left a lot to be desired, but I was happy to pull relics of some new players for a change. This product has multiple game-used cards of superstars like Alex Rodriguez, Barry Bonds, and Tony Gwynn, but how many game-used cards does Tim Raines have? Considerably less. That makes it cool. Somewhere in the $30-40 range is pretty decent for this box when most want $50+. Retail boxes sell for a little bit cheaper, have slightly longer odds as noted above, and contain only one game-used card as opposed to the two for Hobby. Oh, and remember that little peeve I mentioned earlier about this product? Well, here it is. Most of you know that I’ll try all sorts of boxes at least once and in some cases, will try to complete base sets for some of my favorites (such as Fleer Showcase, Topps Gallery, and of course, Gold Label). So, just to mess with us who like to actually hand collate sets of GL, Topps increased the size of the set while drastically decreasing how many total cards you got per box. Add in the fact that the designs weren’t quite as strong as in years past, it’s not surprising, at least to me, why this brand didn’t last another year. 1. I will be on vacation (and out of the country), just over a week from now. I’m desperately trying to finish our break and get the cards mailed out before I go. 2. 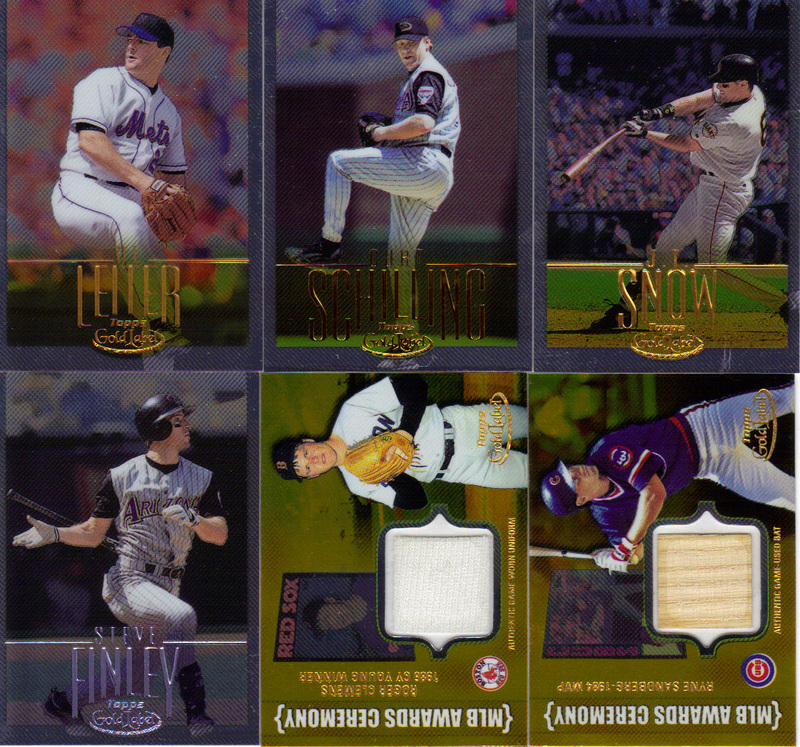 To follow up on the last post, I have decided to go with 2003 Fleer Rookies and Greats (3 hits/5 #d rookies, lots of good stuff per box) as our replacement for the 2002 Bowman’s Best box that no one seems to have, at least at a reasonable price. 3. The other 7 boxes arrived yesterday and after lengthy fighting with my stupid camera, I was never able to record the breaks so I did them off camera. I want to assure everyone that all inserts, parallels, and hits pulled will be scanned and mailed out (except for the Donruss WS Blues which will be mailed but not scanned). 4. I will reveal the results of our break 2 boxes at a time (suspense!). Check back every evening to see how your teams did. First up, the results of 4 bonus packs of 2009 UD Series 1, courtesy of Dave and Adam’s. Now for the good stuff, the Gold Label!